When the right thing’s said, it doesn’t matter who says it. The Guardian has this one right, and that’s that. Was Ma’loula the last straw? Assad’s no choirboy, but Foreign Minister Lavrov is right to point up that if he didn’t have wide support, he’d be dogmeat. Russia and China stood against Western intervention… and they were right. Now, even Establishment voices like The Guardian are getting hip. The West (primarily, American interventionists on both sides of the political aisle) reached its zenith in the so-called Orange Revolution, where it staged a coup against the rightfully-elected President. South Ossetia in ’08 was “a bridge too far”… and Syria merely confirmed the trend. God willing, we can muzzle the godless warmongers in the West. Reflect on this… the most godless are those who use religious rhetoric… the Evangelicals and their fellow travellers aren’t Christian, and the sooner that we realise it, the better we’re off we’ll be. Last week, Prince Ghazi of Jordan joined the Prince of Wales on a visit to an Egyptian Coptic parish in Stevenage and the Syriac Orthodox Cathedral in west London, where he heard from a number of Christian families who’ve had first-hand experience of the rising tide of persecution. He said, “We can’t ignore the fact that Christians in the Middle East are, increasingly, being deliberately attacked by fundamentalist Islamist militants”. Author William Dalrymple said on the BBC last week, “The Arab spring [is] rapidly turning into a Christian winter”. Clearly, this is a sensitive subject. The perceived support that Christians allegedly gave to President Assad in Syria and to the Egyptian army in deposing President Morsi in Egypt made them increasingly the target of violence, with churches assaulted, priests abducted, individuals targeted, and homes looted. In Egypt alone, Amnesty International reported that during this past year, there have been 207 attacks on churches and 43 Orthodox churches destroyed. The situation for Christians in Syria deteriorates rapidly as foreign jihadist militants increasingly influence the Free Syrian Army. Today, many thousands of Syrian Christians flee over the border to Turkey. One man who made the journey from Syria claimed, “Where we live, 10 churches have been burned down. They started to threaten Christians in the town we live. When the local priest was executed, we decided to leave”. All this is a part of a wider picture, which sees Christians increasingly forced out of the biblical homelands. Indeed, across a vast swath of the world between Morocco and Pakistan, the persecution of Christians continues to gather pace, often with barely an eyebrow raised in the secular West. Perhaps, this is beginning to change. Last month Baroness Warsi warned, “A mass exodus is taking place, on a biblical scale. In some places, there’s a real danger that Christianity will become extinct”. On Saturday, the Shadow Foreign Secretary, Douglas Alexander, spoke up against the “political correctness, or some sense of embarrassment at ‘doing God'” that makes this a taboo subject. This reluctance to speak out partly comes from a peculiar sense that there’s a hierarchy of victimhood, with Christians less deserving of concern. No doubt, the historical association of Christianity with persecution of other beliefs… the Crusades, the Inquisition, and so on… is also working away somewhere in the background, as is the idea that Christianity is essentially a Western faith. This links to the worry that supporting persecuted Christians is somehow taking sides in a clash of civilisations. This thought looks especially foolish when written down, which is precisely why it’s worth stating so baldly. One does not have to “do God” to recognise that protecting the rights of religious minorities, as enshrined in Article 18 of the Universal Declaration of Human Rights, is the human rights equivalent of the canary in a coalmine. It doesn’t help that some Evangelical Christians, not least the former archbishop of Canterbury Lord Carey, take every opportunity to speak of Christians persecuted for their faith in Britain. This is nonsense. Furthermore, it’s offensive nonsense, to millions of genuine victims. Douglas Alexander was right, “Across the world, there’ll be Christians this week for whom attending a church service this Christmas isn’t an act of faithful witness, but an act of life-risking bravery”. 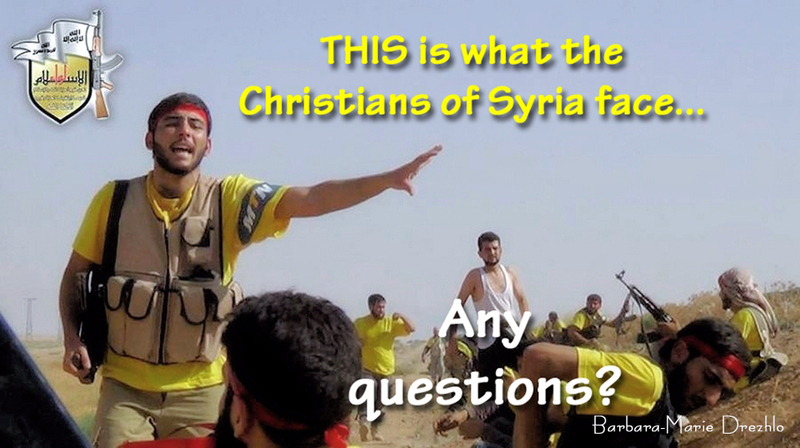 Of course, it’s not just in the Middle East that Christians are targets. In addition, other religious groups are clearly subject to persecution. However, as billions of Christians gather for Christmas, with their attention focused on a troubled town in the West Bank… one from which Christians have also been fleeing for several years… it’s worth recalling that the message of peace and goodwill is hardly a political reality for a significant minority of the world’s Christians. This should concern religious and non-religious alike.